If you read the synopsis of David Cronenberg’s Maps to the Stars, you might scoff at the notion of Hollywood making another movie about Hollywood. After all, in the last five years, three of the five winners of the Academy Award for Best Picture went to films where the entertainment industry anchors the narrative. While I love film in all shapes and sizes, I also cannot help but roll my eyes when these films serve to reinforce their vanity. Birdman, Argo, and The Artist are reminders that Hollywood loves to gawk at the mirror. Well, it is fair to say that Cronenberg’s dark, twisted portrait of the film industry will send Hollywood running to a psychologist’s couch. The principal player in this web of madness is Havana Segrand (Julianne Moore), a washed-up actress who lives under the shadow of her famous mother, Clarice Taggart (Sarah Gadon), who died in a fire. Perhaps because her mother sexually abused her, Havana is haunted by the ghost of Clarice, who drops in unexpectedly in scenes reminiscent of The Sixth Sense. Mia Wasikowska plays Agatha Weiss, who becomes friends with Carrie Fisher through Twitter and becomes Havana’s personal assistant. Agatha has burnt marks all over her body from a fire that she may or may not have caused. John Cusack plays Dr. Stafford, a shrink whose methods borders on emotional torture. Evan Bird plays Benjie, a 13-year old child actor who is already dealing with substance abuse and is a total douchebag. Finally, Robert Pattinson plays Jerome Fontana, an aspiring actor who makes a living by chauffeuring the rich and famous. Cronenberg’s Hollywood is a volatile mixture of Altman’s The Player, Lynch’s Mulholland Drive, and his own eerie sense of humor. While the film has been criticized for getting Hollywood wrong, I do not believe it is Cronenberg’s intent to portray it right either. By probing through the deep psychological layers of his central characters, revealing their repressed fears, nightmares, and desires, Cronenberg also peels away the scabs of Tinseltown, revealing an angst-ridden, self-aggrandizing center. Consider Havana’s storyline and her desire to revivify her career. She pushes heavily to star in the remake of Stolen Waters, a film that earned her deceased mother an Academy Awards. Havana wants to play the role made famous by her mother. Havana loses the role to another actress but after a freak accident that feels both random and predetermined, Havana unabashedly accepts the role. By filling in Clarice’s shoes, Havana aims to conquer her mother’s overwhelming presence and reputation. Havana’s obsession over the supernatural is very much influenced by Hitchcock as she destroys herself over it. Meanwhile, Agatha also has her own demons to exorcise. We learn that she is the older sister of Benjie and daughter to Dr. Stafford and Christina Weiss (Olivia Williams). Christina is also Benjie’s manager. Agatha arrives to Hollywood hoping to make amends with her family after she nearly kills Benjie by intentionally setting fire to their home. Having revealed that her parents are actually brothers and sisters (they did not know because they were separated at an early age, but still…), Agatha also reveals her own hidden incestuous agenda. Like Havana, Benjie is also haunted by daily visits from ghosts that intimate a symbiotic relationship with Agatha. This is essentially what we are dealing with in this film. The outlandishness of Cronenberg’s Hollywood borders on parody. Yet, we are never really sure if he is kidding or if he is deadpan serious. There is a feeling of dread and horror that permeates throughout the film. It is not the sort of horror that makes you jump out of your seat. It is one that reveals the deeply rooted psychological horror that resides in all of us. Benjie is not exactly from Children of the Corn but his vainglorious psychotic tendencies are equally horrifying. In the climax, Cronenberg’s close-up shot of Agatha, as she wields an Oscar statuette that looks like it’s been injected with steroids, reveals a rotten seed that is chilling. Despite the film’s ability to draw us into this world, it also falls short because it is simply too detached. It is incredibly taxing to relate to any of these characters because they are such overdrawn archetypes. It seems that the only character that has any semblance of a normal human being is Pattinson’s character. Perhaps because he is still an aspiring actor, standing on the outside looking in, Jerome most represents us. However, not only does Cronenberg underutilize him, but Jerome also lacks agency for he is just another witness to this madness. This is only the second Cronenberg film I have seen. The first is eXistenZ, a sci-fi horror. Despite having limited knowledge of his filmography, I also feel like I have a good grasp of his style of filmmaking. His visuals are quite unassuming, but he is also unafraid to contort them when the situation calls for it. More impressively, his narrative style is audacious and unorthodox; often letting the psychosis of his character’s drive the film. I think an easy comparison can be made between David Cronenberg and David Lynch. However, Cronenberg’s madness seems more calculated than Lynch’s surrealist mode. Instead, a comparison with Bong Joon-ho is more apt for they both have this unique ability to switch tone at the flip of the switch, creating rather unsettling atmospheres. 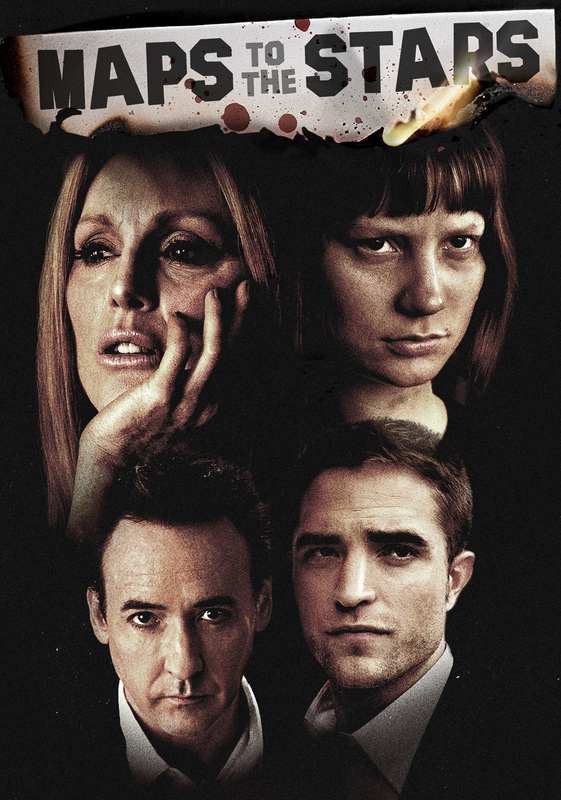 Maps to the Stars is not a home run but it is decent foray into David Cronenberg’s work.